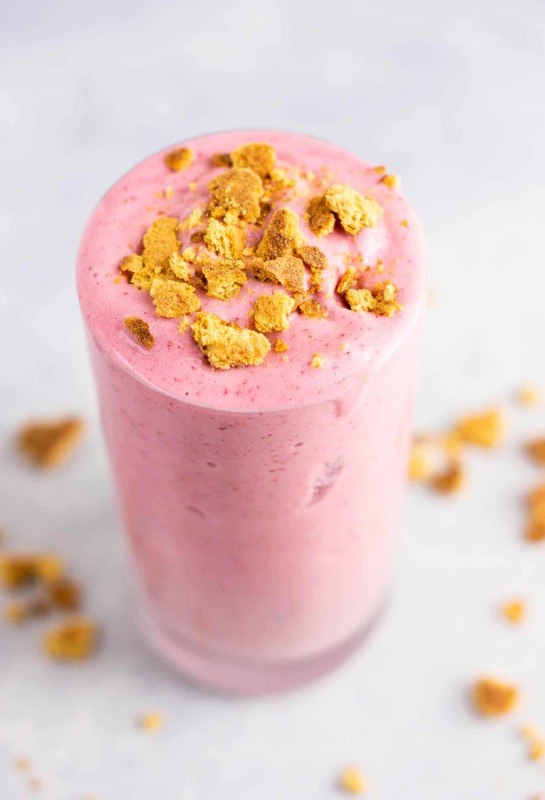 Healthy strawberry cheesecake smoothie – breakfast, snack, or dessert – it’s full of good for you ingredients but tastes like a treat. One important thing with this recipe is to be sure you use plain unsweetened greek yogurt. This gives it the tangy “cheesecake” flavor. If you use a flavored yogurt, it definitely will not taste the same. 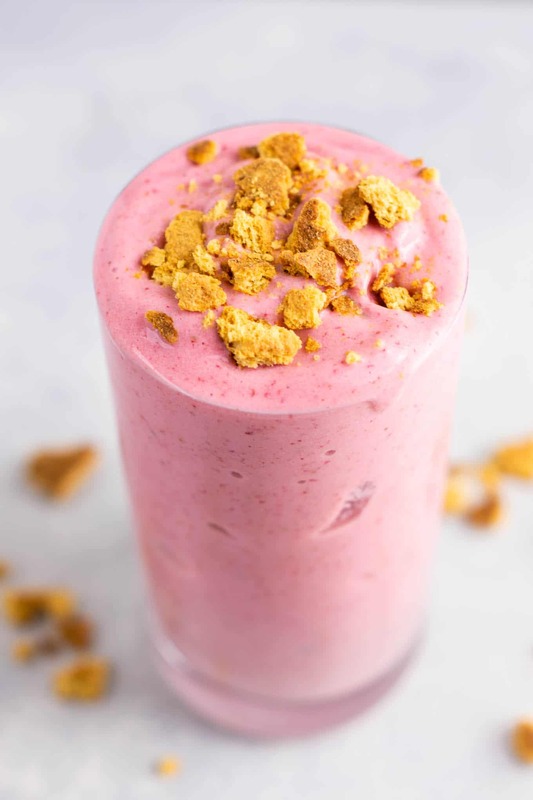 Just like my creamy chocolate breakfast smoothie, this skinny strawberry cheesecake smoothie is rich and indulgent tasting while still being healthy enough to start your morning off with. 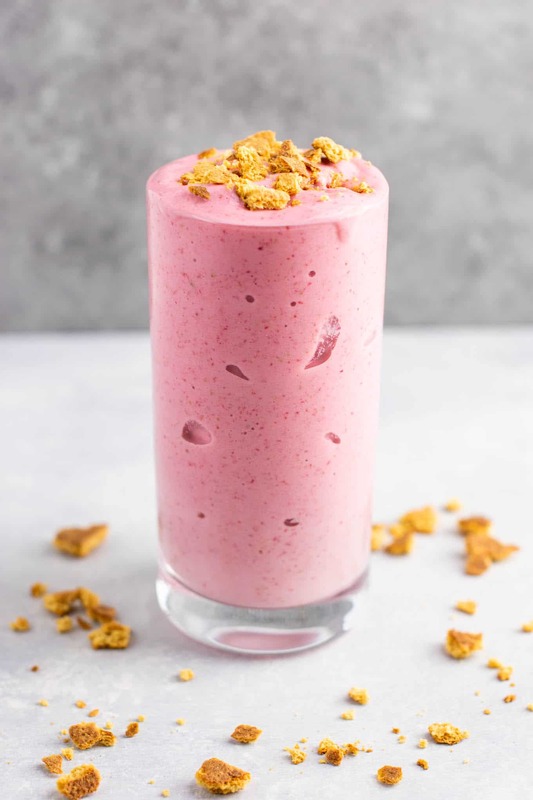 Greek yogurt is a great low calorie way to add protein to your smoothies and makes it very filling. 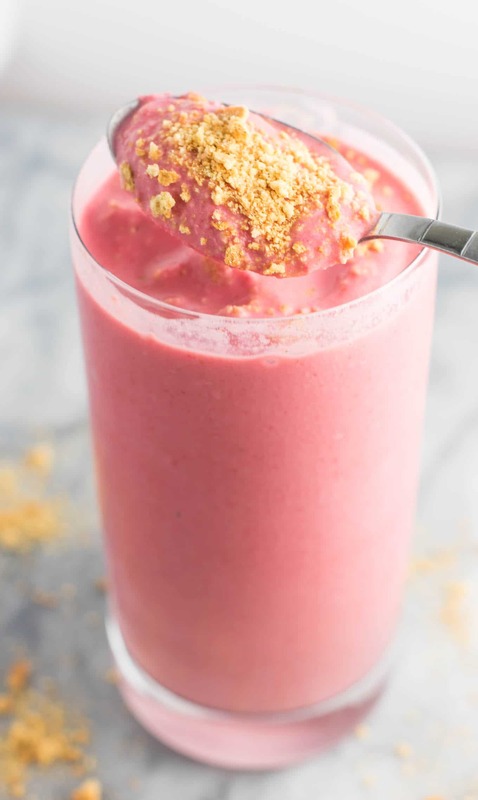 You only need a few ingredients to make this healthy smoothie and I promise you’ll be addicted. 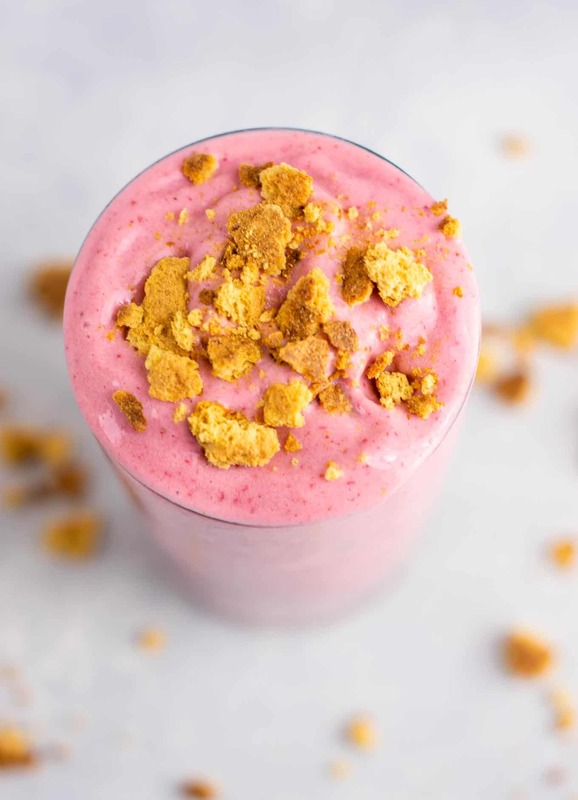 The crushed graham cracker crumbs on top are optional, but I highly recommend them! It seriously tastes just like I was eating strawberry cheesecake for breakfast! So creamy, tangy, and delicious. 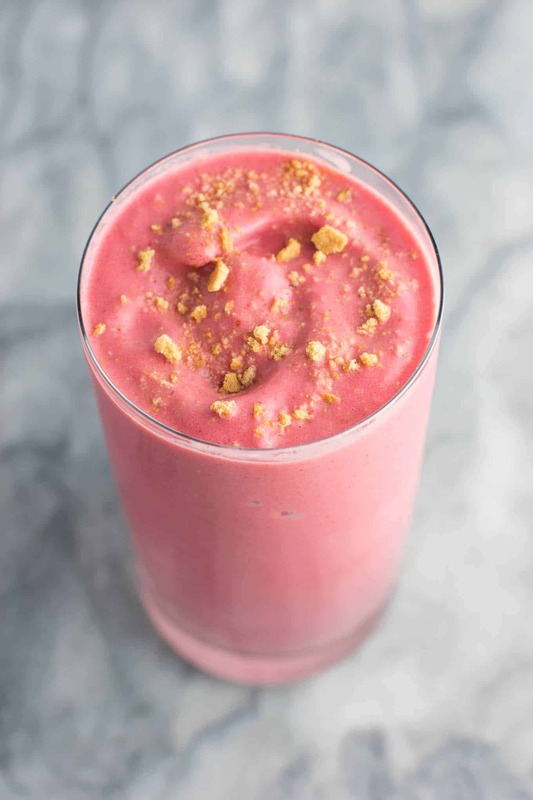 If you want to break out of your breakfast rut or need a healthy dessert that won’t leave you feeling like garbage give this skinny strawberry cheesecake smoothie a try! Hungry for more? 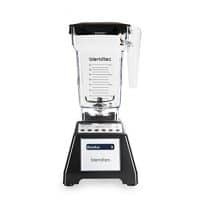 Here are some of my favorite healthy smoothies. 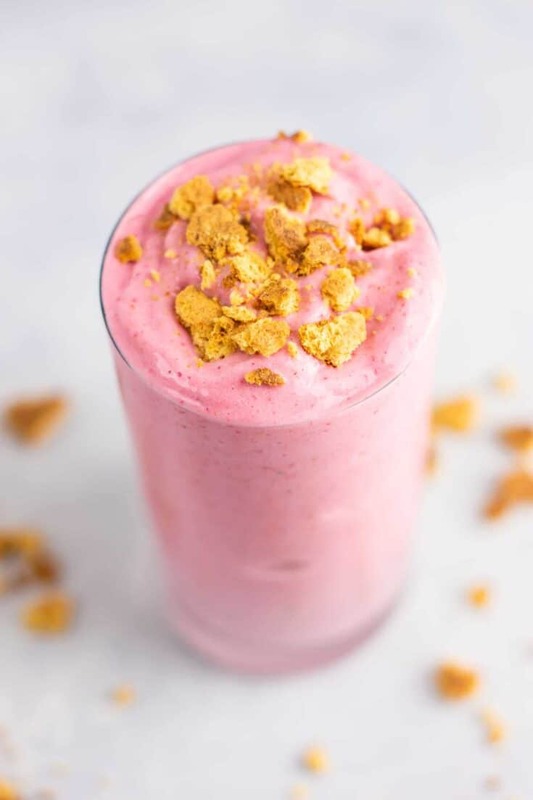 This skinny strawberry cheesecake smoothie recipe is made with just 5 ingredients and healthy enough to eat for breakfast! That looks so yummy! Off to. It some cream cheese tomorrow. Thanks Jeanne! Let me know if you try it! Hi there! I find this to be an excellent recipe, but I want to know if I can substitute some ingredients that I don’t have for others that are similar. For example: Instead of using almond milk and plain Greek yogurt, can I use regular reduced fat milk and vanilla Greek yogurt? Thank you in advance! Hi Veronica! You can definitely sub the milk, but the vanilla greek yogurt might make this taste not as cheesecake-y if that makes sense. It’s the tanginess of the plain yogurt that helps give it that cheesecake flavor. Hope that helps!